A sequel by name only, “The Toymaker” is one of the strangest sequels I’ve ever seen. A young boy sees his father killed by a toy that was anonymously delivered to his house. After that, he is too traumatized to speak, and his mother must deal with both him and the loss of her husband. Meanwhile, a toy maker named Joe Peto (a name that is just too funny to be unintentionally hilarious) builds some suspicious-looking toys, and a mysterious man creeps around both the toy store and the boy’s house…but who is responsible for the killer toys? 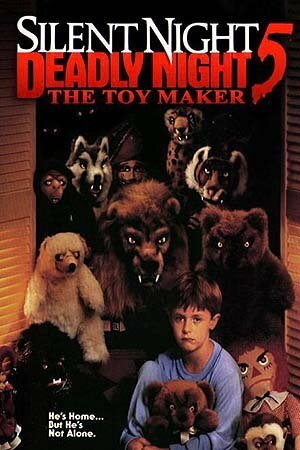 The twist at the end needs to be seen to be believed (shades of “Sleepaway Camp”), “The Toymaker” is fun with a capital F. I can’t in all honesty say this is a “good” film but I can say that you’ve never seen anything like it. Besides who DOESN’T want to see a horror movie version of Pinocchio? Have yourself a bloody merry Christmas and give “Silent Night Deadly Night 5: The Toymaker” a chance. It is 80’s horror at its cheesy finest. Yes, yes I know this movie was made in 1991 but I refuse to believe that. The early 90’s was a time of horror blandness and this is anything but. I can’t say that this movie is for everyone but it doesn’t deserve the reputation it has received. Have a few drinks and enjoy! It’s a lot of fun and very underrated. I think that had it been released as just “The Toymaker”, the film would be considered a cult classic today. This one was quite good. Didn’t see 4, but better than 3. Did not see that ending coming I must admit.